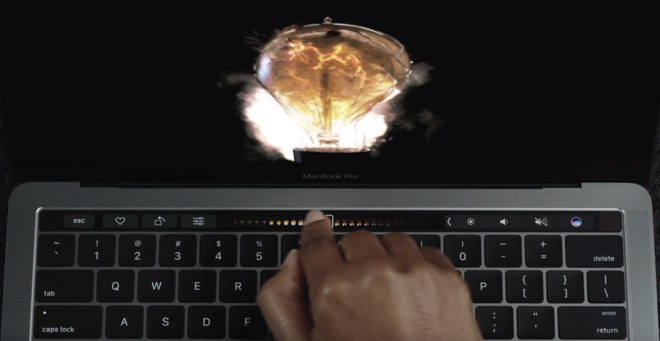 Apple on Thursday premiered a new video ad for the Touch Bar-enhanced MacBook Pro, marketing the computer as a "tool for all the ideas to come." Called "Bulbs," the commercial intermixes footage of a trail of exploding lightbulbs with scenes of various inventions. These range from things like fire and the wheel through to robots, drones, and rockets. Self-referentially, some shots include things like an iPhone, and Isaac Newton's discovery of gravity —alluded to by an apple falling from a tree. Apple's original logo from 1976 depicted Newton's famous eureka moment. The Pro itself doesn't appear until the last few seconds of the ad, when someone is shown using the Touch Bar to scrub through a video of an exploding bulb. The first shipments of the new MacBook Pro began reaching the public earlier this week. Readers should check out the official AppleInsider review to see how the laptop fares in the real world.